BuildTrack has partnered with Indiabulls to bring you high efficiency & innovative LED lighting solutions. Indiabulls Group introduced IB LED Professional Lighting Solution for offices, malls, showrooms, factories, industries & housing societies. 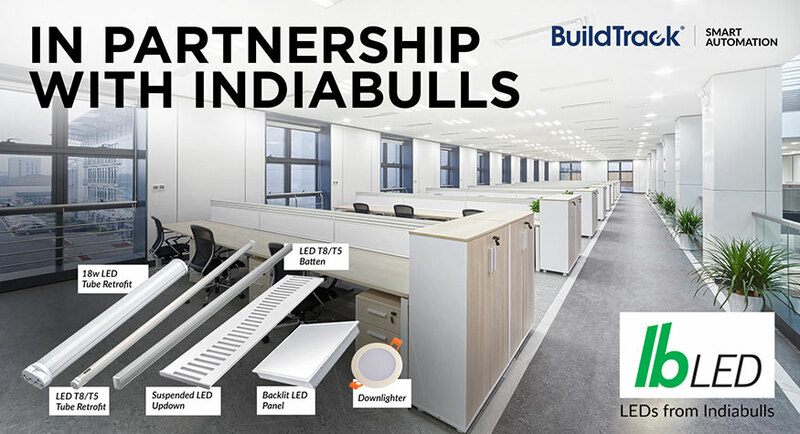 These LED Lighting Solutions by Indiabulls can be integrated easily with Wireless or Wired BuildTrack Motion Sensors to facilitate ZERO energy wastage. The solutions include fixtures for standard T8 & T5 Fluorescent tubes & PL Lamps for new and retrofit situations. BuildTrack Energy Efficiency Solutions offer flexible ways to significantly reduce energy bills in any commercial, residential or industrial space. Our solutions completely eliminate sources of energy waste; Provide centralized control of all existing switches & devices; and provide live monitoring of all energy consumption. BuildTrack Wireless Sensors can be installed with no wiring or aesthetic impact in finished spaces, to eliminate wastage of all lights, fans and AC’s. About Indiabulls (http://www.indiabullsled.com/): Indiabulls Group is one of the country’s leading business houses with interests in Housing Finance, Real Estate, Infrastructure & Securities. Continuing the genesis of its desire to keep re-inventing, Offering a plethora of products, IB LED provides complete range of LED lighting solutions, and BuildTrack is happy to have partnered with IB LED for offering solutions that reduce energy wastage. About BuildTrack (www.BuildTrack.in): BuildTrack is a leading brand of Smart Automation & Internet of Things products and solutions from Surmount Energy Pvt Ltd. BuildTrack solutions deliver Safety, Security, Sustainability, Comfort, Convenience and Operational Productivity. BuildTrack manufactures its own line of sensors, controller, switch nodes, cloud services, smart apps and more to deliver a number of reliable wired and wireless automation solutions for homes, offices, buildings, hospitals, hotels, warehouses, corporations, IBMS, Energy Efficiency and more.